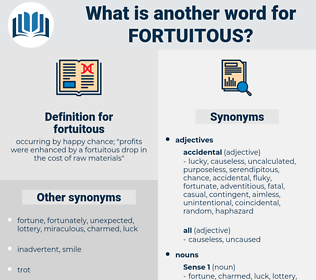 What is another word for fortuitous? 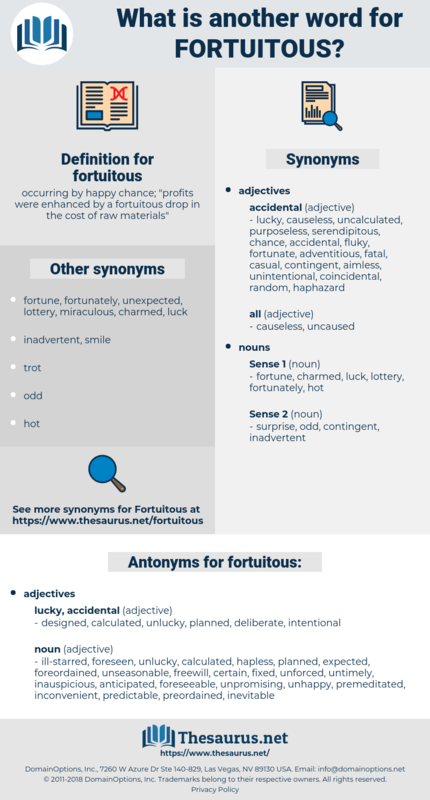 occurring by happy chance; " profits were enhanced by a fortuitous drop in the cost of raw materials"
inadvertent, unintentional, occasional, unintended, unexpected, causal. coincidental, incidental, random, unforeseeable, casual. designed, calculated, unlucky, planned, deliberate, intentional. ill-starred, predictable, inopportune, prescribed, unhappy, anticipated, premeditative, inevitable, unseasonable, foreseen, sure, predestined, premeditated, knowing, fixed, inconvenient, predetermined, set, inauspicious, expected, untimely, hapless, willful, Star-crossed, Prepense, conscious, certain, unpromising, volunteer, luckless, unforced, ill-fated, destined, foreordained, preordained, freewill, voluntary, foreseeable. Sydney Smith was a curious contrast to Jeffrey in almost every respect except in politics, and even there the resemblance was rather fortuitous than essential.